Will Hide discovers colourful coffins, spinning snails and statues of Chelsea players on a trip around Ghana’s capital. Accra’s plentiful fleet of battered, multi-coloured taxis are cheap but be prepared to negotiate before you set off – a standard journey across town should cost around 15 cedis (£5), but you’ll be asked for more. As with most things in Ghana, though, haggling is done with good grace, not aggression. Your first stop – and assuming you’re doing this outside of rush hour and don’t want to sit in traffic forever – is the coffin makers in the suburb of Nungua, about a 15- to 20-minute drive east of the centre. Come again – coffin makers? These aren’t just any old caskets. As you drive up Teshie Road, look out for the weird and wacky designs that have become works of art, displayed in galleries in London and New York. For around 3,000 cedis (£1,000) and upwards you could spend eternity inside an Olympus camera, a pineapple, a lobster, a tow truck, a cocoa pod, a judge complete with robes and wig, or, this writer’s favourite, an ice cream sundae. There’s no problem pulling up to the likes of Paa Willies on Nungua’s main road, or Hello Design Coffin Works in nearby Teshie. One of the coffin makers will happily break off to show you around and explain the process, for which they’ll expect a few cedis in return. Drive back to town and spend some time at the Kwame Nkrumah Memorial Park, which houses the mausoleum of the statesman who led Ghana to independence in 1957 and founded the Organisation of African Unity. The small museum just behind takes a reverential look at the leader, who was nonetheless deposed in a coup in 1966 – his decapitated statue stands outside, with the head on a plinth next to it. But the collection of old black and white photos – Nkrumah and his Egyptian-born wife smiling stiffly with Mao Tse Tung and the like – are a nostalgic, somewhat kitsch look back at post-colonial history. The two-hectare park itself is a welcome respite from the bustle and noise outside. Open daily 10am-6pm, entry is 5 cedis (£1.70); tel +233 302 671 610. A five-minute walk up 28th February Road is the Centre for National Culture, known as the Arts Centre (open 8.30am-5pm Mon-Fri, 9am-3pm Sat-Sun). It’s a good spot for souvenirs if you don’t mind running the “my friend, my friend, just come in and look” brigade, but it’s all done with a smile and a lack of harassment. You can buy everything from T-shirts, Kente cloth and West African masks to wooden statues of local hero Michael Essien in his Chelsea kit. The outdoor market is less intense than the warren of alleys under cover, but whichever one you end up in, put your bargaining skills in top gear. If you’re craving some air conditioning, you could do worse than this modern mall, about ten minutes’ drive north, which has two large South African supermarkets, a cinema and a decent-sized bookshop among its offerings. Woodin (woodinfashion.com/fabrics.php) sells brightly patterned cloth that can be made into dresses and is a good, easy-to-pack gift – you’ll see plenty of stylish local women wearing it. Men’s shirts cost around 35 cedis (£12). There’s a food court with mostly fast-food options, or if you just want a drink, drop into the large and friendly bar at Rhapsody’s (rhapsodys.co.za), which has free wifi. Nearby, Wild Gecko is a good place to shop for quality souvenirs, with no pressure (open Tues-Sat, wild-gecko.com). Prices are marked, although negotiation is possible. with Marco Pierre White, it’s an oasis of calm with interior design by Givenchy and developed by the team behind Nobu in London. This museum – on Barnes Road, a ten-minute drive down Liberation Road – may not be quite up there with the grand collections of Europe or America, but what it lacks in size it makes up for in friendliness and pride – ask your guide to challenge you to a game of alukoto, where you spin a pointy snail’s shell with an opponent, and the loser has the sharp end of the shell snapped down hard on the back of his hand. The museum was opened in 1957 and there are those who might argue not much has changed since then, but it provides a fascinating, if somewhat dusty, look at Ghanaian and West African history from pre-colonial times to the slave trade and independence. There’s also temporary exhibitions and a small shop. Open daily 9am-4.30pm; entry is 9 cedis (£3). 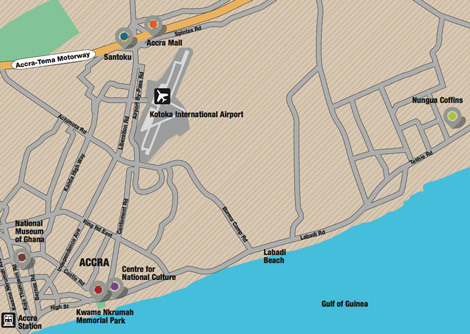 To book a hotel in Accra through our partner hotelscombined.com, click here.